So the big days arrived, what happens? 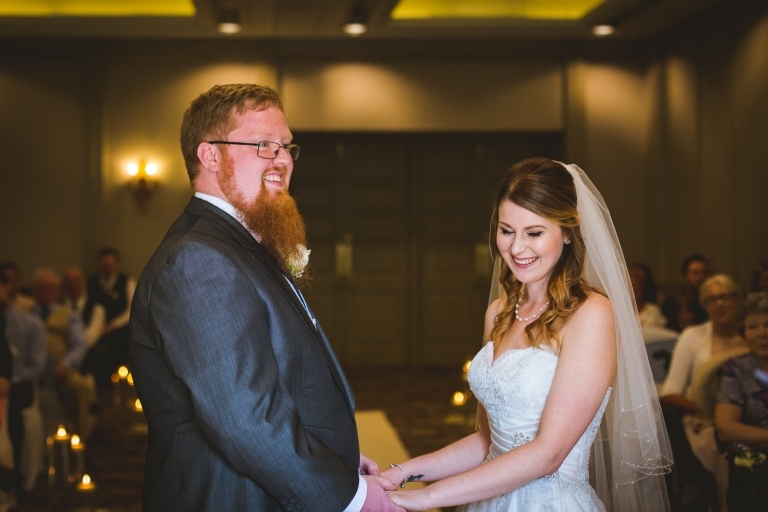 If you've been to a wedding before, you'll be familiar with how the day runs, but if not, this part will be useful for you. 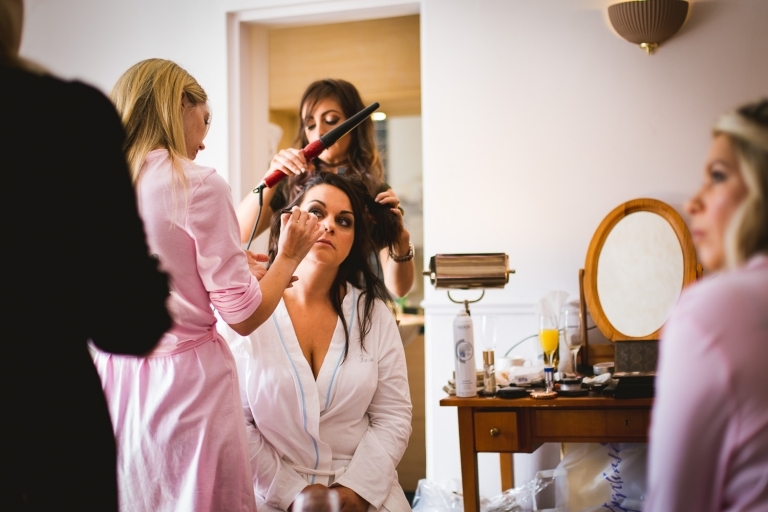 For bridal prep I like to arrive 2-3 hours before the ceremony. This gives me enough time to photograph all the details like the dress hung up, ceremony room etc as well as capturing everyone getting ready, laughing, having a glass of bubbly and dad crying. It also builds a bond between me the bridal party. If the groom is getting ready near by or in the same hotel, I'll always stop off by them first, especially if a pub stop is involved. It tells a better story when you receive your photos. 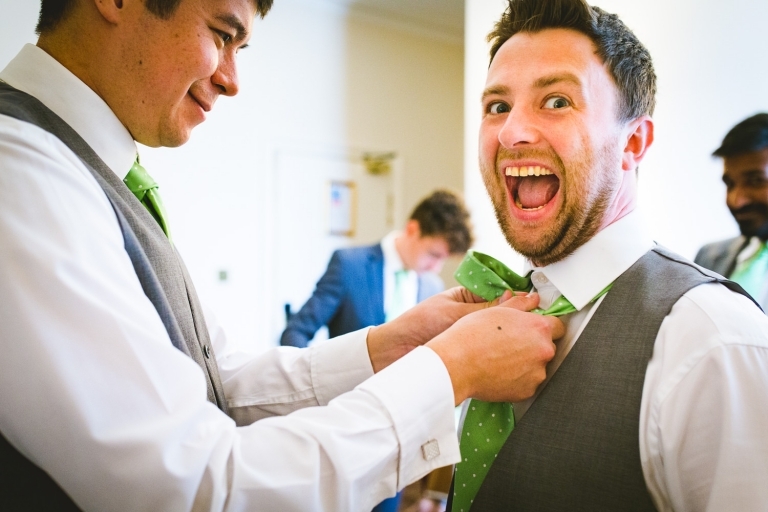 Of course if you want more coverage of the groom prep, a second photographer can be added. Whether you have a church or civil ceremony I'll always aim to arrive 30 minutes before so to get the groom sweating and looking nervous. I won't leave for the ceremony until you've got your dress on though. If you have a church ceremony, please be aware that not all Vicars allow photography and some send us to the back. I'll always try and come to the rehearsal and if I can't, I'll ring the vicar ahead of the day to sweet talk him and let him know I won't be a pain. 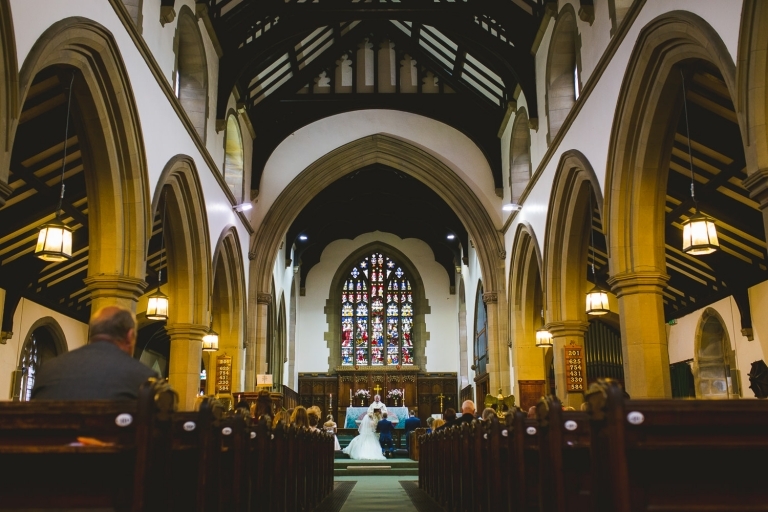 Timings can vary for both civil and church, but a civil ceremony is usually around 10 minutes (with out any readings or poems) and a church ceremony is usually around 45 minutes. This is one of my favourite parts of the day and where I'll capture your guests enjoying a drink, congratulating you and enjoying any games or entertainment that you may have provided. This can also be a long boring part for guests too, so it might be worth looking into entertainment like a magician or to keep things cheap, some outdoor games or board games. These will make for great photos too. It's during this part of the day I'll grab detail shots of the wedding breakfast room too. The only part of the day that is truly posed. I'll start these 10 minutes into your drinks reception so you've had chance to talk to your guests first. I try and get this done as quickly as possible so you and your guests aren't stood around for ages, but this does depend on how many groups I get given. Pretty much straight after the groups we'll go for a wander round the grounds for 10-20 minutes. Really relaxed, casual and minimal posing. Basically I'll let you two catch up and have cuddle away from everyone. It's completely up to when to have speeches, although I'd suggest either before or after and not in between each course. I personally had them before the meal, I just wanted them out of the way. This is the part of the day where everyone's in a food coma. The time between the wedding breakfast and the evening reception. Usually I'll ask you if you want some more couple time where I might set up something more dramatic with flash or grab you while the sun is setting, but it's completely up to you. I'll be photographing guests anyway. Unless you've paid for extra hours I'll stay until the first dance (up until 9pm) and a bit after. I like to end the night photographing people dancing, so if people are up dancing, that's where I'll be. This part of the day I like to keep as short as possible. There's nothing worse than standing in a line to have your photo taken for over 30 minutes when you could be talking to all your guests. I suggest choosing no more than 10 groups. Each shot usually takes around 2-3 minutes and depending on the size of each group the total session can take up to 30 minutes. More than 10 groups can extend this time leaving less time for your couple time and even less time to talk to everyone and enjoy those canapés.